Photo Credit: AP. I just thought we needed to see this moment again. The Bento Era has begun. And with it, the Captain Sonny era has also begun in earnest. It was confirmed over the international break by Ki Sung-yeung here that Paulo Bento has named Son Heung-min as the team’s captain. Ki said that he agreed that it was time for Sonny to be named captain so that he can lead the squad through the entire 4-year World Cup qualifying cycle. In my opinion, this is an important moment for the KNT moving forward. Sonny is undeniably the most talented player on the squad and now will be tasked with stepping into the role as the team’s talisman. Is he ready for this responsibility? Let’s take a look at the evidence we have so far. We’ve all heard the criticisms of Sonny when he puts on the KNT kit. He tries too hard to make things happen on his own. He is selfish with the ball and makes poor decisions to shoot. He doesn’t trust his teammates well enough to pass to them when they are in better position to score. He has bad body language and gets frustrated when he can’t find the net. He becomes a shadow of the player he is at Spurs. All of these criticisms have evidence to back them up. However, since Sonny started wearing the captain’s armband, I have noticed a clear change in how Sonny carries himself on the pitch. Let’s go back to the first match that Sonny wore the armband: that famous win over Germany. Ki was out injured so Sonny stepped up to lead the Taeguk Warriors out in the must-win Group Stage match. Take a look at that picture above. That’s Sonny celebrating his goal that made the score 2-0 and sealed the victory. It’s a small detail but I think it has meaning. The subs bench went absolutely wild when the ball hit the back of the net and Sonny ran right over to celebrate with them. This was a huge individual moment for Son to score what could have been the goal to send Korea into the knockout rounds. In that moment though, it was all about the team. The team was happy for Son and he was ecstatic to celebrate with them. Let’s fast forward to the Asian Games where Son was asked to be the captain of the U23 squad. In the second match of the group stages, Korea suffered a disappointing loss at the hands of Malaysia, 2-1. The team was dejected and the press was starting to worry about just how good this squad was and if they would be able to win the Gold Medal that Sonny and the players needed for military exemption. The team rebounded with a slim 1-0 victory over Krgyzstan in which Son scored the only goal off a corner kick. The level of play from Korea in the final two group stage matches was not going to be good enough to win the tournament and Son knew it. Son Heung-min on scoring the winner as Korea beat Kyrgyzstan 1-0: "I hope to have a meeting with my teammates to discuss how we could improve. This was not a satisfying performance, but it's a relief that we won. We did give our best effort, but that should always be a given." In that moment of adversity, Son stepped up right away and showed the leadership to admit that the team wasn’t playing well enough. He made plans for a meeting with the squad to figure out what could be done to help the entire squad play better. The results speak for themselves. Korea improved their play and went on to claim the Gold Medal that unlocks career opportunities for all 20 squad members. Let’s take a look at another moment from the Asian Games that garnered a lot of interest. You’ve all seen it. There were a lot of talking points after this moment lit up Twitter and Instagram. I want to bring up something that I thought about when Sonny commented on why he didn’t take the penalty himself. He said he wanted to give Hwang Hee-chan the chance because he felt that Hwang needed a confidence boost. Looking at the summer that Hwang had endured up to that point, I applauded the decision. Hwang Hee-chan had endured a frustrating summer in a KNT kit up to that moment. He showed all the work rate of a top player but little else. His passes weren’t coming off and his touch was letting him down. When he got in front of goal he either shot right at the keeper or missed the net entirely. The low point for him was the Germany match. He was subbed into the match in the second half and then hooked by Shin about fifteen minutes later because he wasn’t tracking back to the manager’s liking. 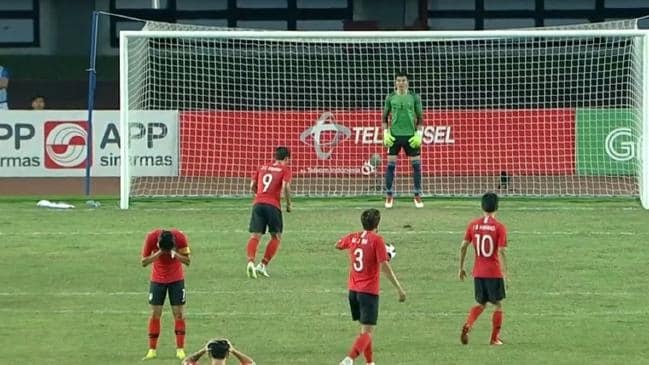 In the Uzbekistan quarterfinal, the match was tied at 3-3 in extra time when Hwang Ui-jo won a penalty. Hwang Hee-chan stepped up to score the all-important winner for the Taeguk Warriors. It wasn’t the best penalty (the goalkeeper got a hand to it), but it got the job done. And it also could have provided the confidence boost that Hwang needed. In the final, Hwang leapt forcefully into the air to bury an absolutely beautiful header to seal the Gold Medal. Maybe, just maybe it was that boost of confidence that Sonny gave him with the penalty that helped him know that the captain was trusting him in that moment to bury the header. Sonny laid the ball on a platter and Hwang came up huge with another extra time winner. Finally, let’s talk about the Costa Rica friendly and Sonny’s play. Bento clearly gave him a role as the playmaker of the offense. Bento wasn’t asking Sonny to go out and score the goals to win. He was asking him to drive the offense forward. I was incredibly impressed with Son’s play in that role. He drove at the defense every chance he got and looked for the right passes. On Nam Tae-hee’s goal, he played the through ball to Nam and let him go to work on the defenders. Finally, when Son was subbed off I caught another little moment that I want to point out. Sonny points to his head and signals to the team that there’s 10 minutes left to play. He gives a little “Come on!” to his teammates and hands off the captain’s armband. It’s a little thing but it shows his commitment to leadership, even as he’s exiting. It’s the captain telling his teammates to keep focused and stay on their toes even though they’re up 2-0. Being a captain is about all those things. It’s about being the leader your teammates look to throughout the match for guidance. It’s about providing that guile, setting the tone, and communicating effectively so the team can execute the manager’s tactics. Thus far, it looks like Sonny is taking his responsibility to lead the Taeguk Warriors with aplomb. The team has responded in kind. Thanks for the article. Just curious… who else could be the captain? Son has his faults and obviously his strengths, but… I can’t imagine who else would be the captain at this point. He’s at the right age to take over and yeah has a lot of KNT experience at this point. I thought it was a given that he would be? It’s been great to see Son grow as a leader. The AG was so much fun to follow, not only because of the obvious #SavingPrivateSon, but there was the unexpected joy of watching a great athlete grow into a respectable captain. It feels like the puzzle pieces are finally coming together. With all his experience abroad, naturally Son’s not concerned with the age-based hierarchy. It’s important that young players like Hwang Heechan and Lee Seungwoo can feel confident and take those shots that normally would be reserved for the most senior player of the team. (I mean the story behind Lee’s goal during the AG finals… it still astounds me lol) It’s crucial to the KNT that they have a captain and coach that will respect and nurture young talent instead of fearing them. Really excited to see what’s in store for Captain Son int he Bento era!! Unrelated, but what happened to the Tavern’s twitter? Thanks for the heads up! I don’t know how those WordPress sidebars work but we’ll have a look! HI, I HAVE FINALLY FIXED IT! THE TWITTER TIMELINE IS BACK! I’m glad that it doesn’t seem like Son is expected to bear the entire burden of scoring anymore (only 1 gl in Asiad, but 4 assists iirc); having him try to shoulder everything hasn’t worked too good in the past. He seems to work best playing off a #1, w/ the freedom to roam & poach; might there be someone, LSW perhaps, who could fill that #1 role? He certainly has the attitude of a #1, which may be in Son’s makeup. Yeah he def needs to get stronger, not be knocked off the ball, get dispossessed so easily; maybe if he could become more Messi-like? No brute force necessary, just wizardry? I still hope for an LSW/SHM short-long strike combo. Also, wanted to ask if there will be a writeup/profile on Bento? I very much want to be optimistic, but his recent work/club history hasn’t been the most encouraging. Were those flukes, was he not given enough time & support to implement everything he wanted? Yeah Bento’s recent work history doesn’t look encouraging, but don’t forget Hiddink was in a similar situation when he became manager of KNT. Hiddink’s managerial career was going downhill, but we all know what he achieved with the national team. I heard Bento is a very controlling and intense type of manager. His intense coaching style might have not been a good fit with some clubs. Hi Dae, we were thinking of doing a profile on Bento but we realized we don’t know enough about his previous managerial roles to do it justice. So we’re working on an idea of watching the October+November friendlies to do a Bento KNT tactics deep dive in the leadup to the Asian Cup! Keno, that happened 2 years ago my man. And Lamela has gotta shoulder some blame for taking part in the argument too (I’m no fan of Erik Lamela). But I don’t know, doesn’t seem like that incident is relevant anymore. That’s just my opinion. Point is that he changed. I think it’s relevant. Someone can interpret it either negative or positive. Yeah, I get your point now. It’s a good observation to make in terms of how Sonny has evolved. Hopefully it shows to be a positive evolution and not a negative one. Lamela missed that penalty he took from Son. Yeah not a fan of Lamela much after that incident. I have a post request: can y’all keep tabs on the conversation the KFA is having about hiring mental coach / a psychologist for the men’s KNT? A Q&A slideshow about these topics went up on their Instagram page this morning, and a post about this would be interesting. Woops, I meant A Q&A slideshow about this topic. Hi Evelyn, I saw this Yonhap article on the forum the KFA had with fans to discuss the national team, http://english.yonhapnews.co.kr/search1/2603000000.html?cid=AEN20180920007800315. It looks like there will be 3 more fan forums conducted by Hong Myung-bo this year and then the KFA will make an announcement on measures they intend to implement in January of next year. We’ll definitely put up a post with our thoughts on that forthcoming KFA report!